Armone rolled out of the wheel well of the CESSNA he had stowed away on and shivered. He had almost frozen to death as he was in that wheel well for the whole 1600-mile trip from Amarillo to Oaxaca City. He had only survived because he was able curl up next to the firewall and absorb a little heat from the engine. It was a big risk, he knew, but after he had gotten the message from his cousin, Augusto, he knew he had to chance it. The message had been short and succinct - - “Come quick, family honor in danger.” He had no way of knowing what, exactly, that meant, but he knew it was important that he got there as PDQ! Finally getting his land-legs back, he made his way to the edge of the airfield and tried to get his bearings. Much to his surprise, and delight, he was almost immediately greeted by his cousin, Augusto. Armone gave his cousin a quick once-over and noted how apt a description the phrase “just fell off the turnip truck” would be. Sporting what appeared to be a relatively new straw hat and sucking on a piece of what was undoubtedly the same type of straw, he greeted Armone with a big toothy grin that highlighted the fact that his teeth were not exactly a complete set. He shuffled more than walked, and Armone truly believed that his shadow beat him to their destination at least three out of every five times. Augusto was, without a doubt, a “hick” with a capital H. Still, he was family, so Armone greeted him warmly. Armone just sat there and stared at his cousin, who had delivered that entire barrage of verbiage without taking a breath! Shaking his head with unabated disbelief, Armone finally responded. “So how, exactly, are we going to determine who the best lover is?” Armone wondered aloud. While it was a simple solution to what clearly was a complicated problem, it was, at least, a solution. Agreeing that he was happy with the arrangement, Armone accompanied Augusto home. It was agreed that his cousin would go tell the prettiest female in Oaxaca - - a real looker by the name of Felina - - what they were hoping to do. If she agreed, the two “amorous armadillos” would square off the next afternoon. She agreed. And, by two pm the next day there was one of the largest gatherings of armadillos that Armone had ever seen. On one side was Augusto and the rest of Armone’s family, across from them was the other competitor and his supporters. In the middle, of course, were Felina and her sister, Rosa. Both girls were, Armone had to admit, striking. Augusto briefly explained the rules, and the game was afoot! Armone and his adversary stood tail to tail, and then stepped off five paces and whirled around - - each striking his most appealing pose. Felina would compare the two, and then make her choice. Convinced that this was no contest, Armone compared himself to the other male in the mix. His challenger was, Armone had to admit, quite the armadillo. He was your typical Nine Banded variety, with a light gray, light blue hue. His front claws were long, making them excellent for digging burrows. His snout, too, was long which made it handy for scrounging for food. He was not, however, any match for Armone! Which of his own traits, Armone wondered, would sway Felina to choose him? Would it be his stout, elephant like legs and feet, or his multi-colored serpentine tail? Perhaps it would be his quilt-like bands, each a different color and each a thing of perfection. And how could Felina, or any other female for that matter, resist his calico ears, piercing eyes, and geometric colored chest? 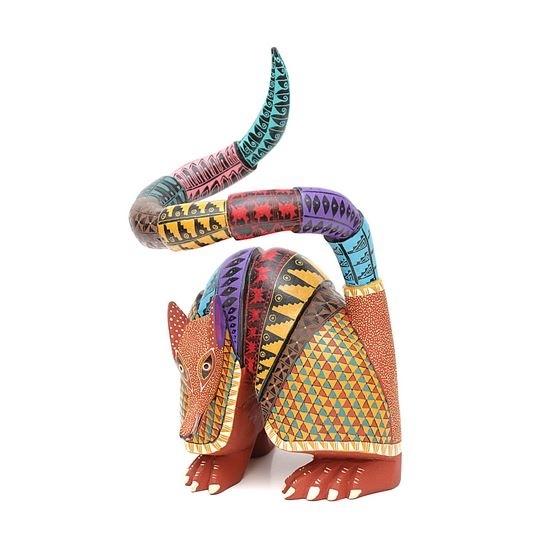 Comparing the Oaxaca armadillo to him would be like comparing the Taj Mahal to Augusto’s hut! Smiling at the very thought, he scarcely noticed that Felina had completed her inspection and was ready to make her choice. Shocked, Armone just stood there and watched as the two of them strolled off together. Well, he thought, at least the family’s honor had been preserved. And, he thought as he made his way towards Rosa, maybe this one would have better sense than her sister!